Green is my favorite color and I would love to visit the Emerald Isle someday. With the Spring full of promise and expectations like anything new in life. Let's take a breath of the beautiful blossoms from my Pear tree and jump into Spring. The table is set for the traditional taste of Corned Beef and Cabbage. Green vintage glasses remind me of Shamrocks and the gold chargers and flatware remind me of the pot of gold at the end of the rainbow where the leprechauns would store away all their coins. The table is set with White Johnson Bros. tea cups and saucers and a white tea pot. To the Irish, no kettle for tea and no pot to serve it in is as punishing a fate as the Furies can configure. Because in the land of mists and moors and scholars and saints, tea is, despite what others may insist the social libation of choice. about six cups a day for each person-the phrase "let me put a kettle on" is equivalent to the American "hello." It is a the very genesis of Irish hospitality. Fresh linen napkins tied with a shamrock ornament and a satin ribbon. Shamrocks and ribbon are from Jo-Ann fabrics. I'm joining some great St. Patrick's Day celebrations. Please link up and visit them. Hi Betty! Your table is just gorgeous! 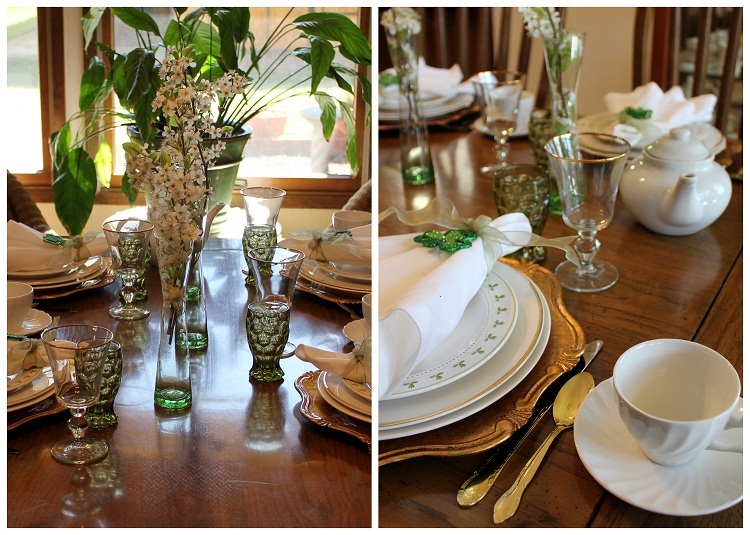 Love your pretty dishes and your little St Paddy's day touches! Hope you've had a great weekend. Such an attractive table. I love your gold chargers and layered plates. The napkin rings are darling and your vases of blossoms are so cheerful and creative. Ohhh my...your spring table is simply gorgeous! I think you "had me" with the pretty vases of pear blossoms! Hehe! They really are lovely! I don't believe that I have ever been around pear blossoms...I'm wondering if they have a fragrance? Anyway, they make a beautiful centerpiece for your spring table! Beautiful place settings! Love the salad plate with the green shamrock looking pattern...pretty...pretty! Thanks for sharing your lovely table with us...it truly was a breath of fresh spring air! Green is a favourite colour of mine too. I adore your pear blossoms and they lend a fairy like feel to your table! I'm sure the wee folk love them too. We had a pear tree when I was growing up. I remember it was so pretty filled with blossoms in the springtime! Your china is lovely and I love all your St. Patricks Day touches. Wonderful chargers! Such a pretty table! I enjoyed your description of everything too with references to the Irish way of life. I so enjoyed your post. Thank you for sharing your pretty Spring-like table and joining me for tea. Happy St. Patricks Day! Your tablescape is gorgeous and I love the gold chargers. What a beautiful table. The chargers are fabulous, and every little touch is special. I love that salad plate with the green. It all looks wonderful. Thanks so much for taking part in the blog crawl and Slainte'. Loved the comment about the tea, so true! Betty, I love your tablescape...so pretty!! I love the saying about the tea. It's kind of my philosophy, too. I guess being Irish rubs off on me. Happy St.Paddy's Day. Im your newest follower. I would love if you'd follow me back! Totally beautiful and even better when you have found so many things on the cheep! Brava! 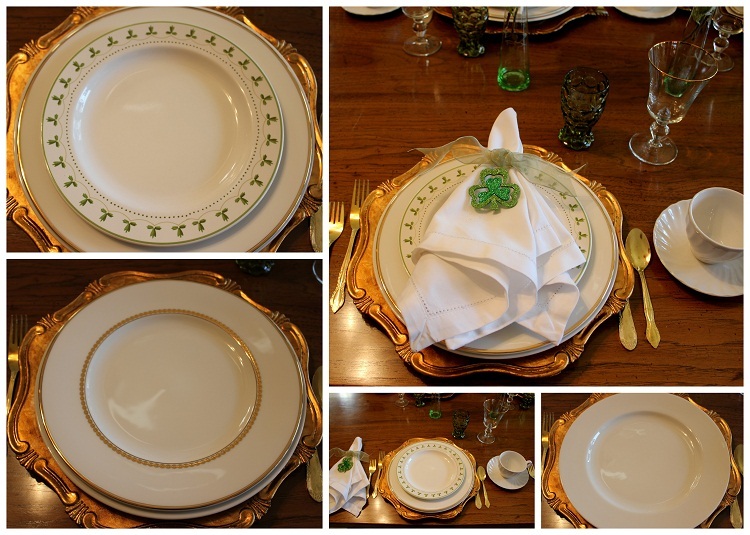 You can certainly celebrate St. Patrick's Day with that wonderful tablescape..Everything is so beautiful and I am so loving those chargers! Happy St. Patrick's Day...AND..Happy Belated 50th Anniversary! !..That is so wonderful! This is so elegant. Love your pretty plates and the lovely greens upon your tablescape.